The television director of Burundi’s National Radio and Television, Nestor Bankumukunzi, poses in studio, in Bujumbura, May 15, 2015. 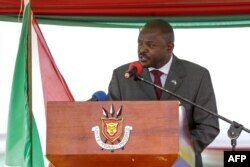 Burundi’s president, Pierre Nkurunziza, speaks after signing a new constitution following a referendum in Bugendana, Burundi, on June 7, 2018. The change will allow Nkurunziza to hold office for more two more seven-year terms from 2020 onward. In a phone interview with VOA, Willy Nyamitwe, senior adviser to Burundi’s president, Pierre Nkurunziza, said the news organizations were banned for spreading falsehoods.